Sorbet is easy to make, as long as you have a Cuisinart ICE-50BCC Supreme Commercial Quality Ice Cream Maker! Although it makes ice creams and sorbets LOUDLY, it's worth the price of the appliance since you don't have to think ahead to freeze a canister. It comes with its own compressor, so you just have to plug it in and use. Sorbet is a smooth, sweet, fruity frozen mixture that contains sugar, water, and fruit (either juice or puréed). It doesn't contain any dairy. The nice thing about this recipe is that it's easy. First you have to melt the sugar in the water and vanilla over medium heat. Purée the strawberries in a food processor along with the lemon juice. Cool the sugar syrup mixture before adding the puréed strawberries. Then, just process in your ice cream maker. Simple. You can find the recipe for Strawberry Sorbet in the Le Cordon Bleu at Home cookbook (page 176). Even though it's not strawberry season up here in wintry Ottawa, with enough sugar, vanilla and a squeeze of lemon, the strawberry flavor comes through sweet and strong. This sorbet is best served with Génoise with Chantilly Cream and Strawberries. Looks delicious! 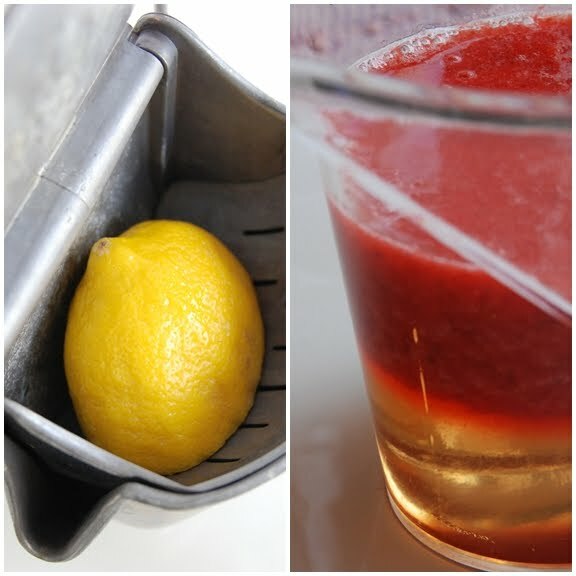 One of my favorite made-at-home versions was one I experienced a couple years ago with guava. Still working on mastering the art of ice cream in our ice cream maker, we may just have to take a break and give this frosty treat a whirl!! This sounds so refreshing! You have me thinking warm weather to come! Niice! I love that last picture of the sorbet on a spoon. 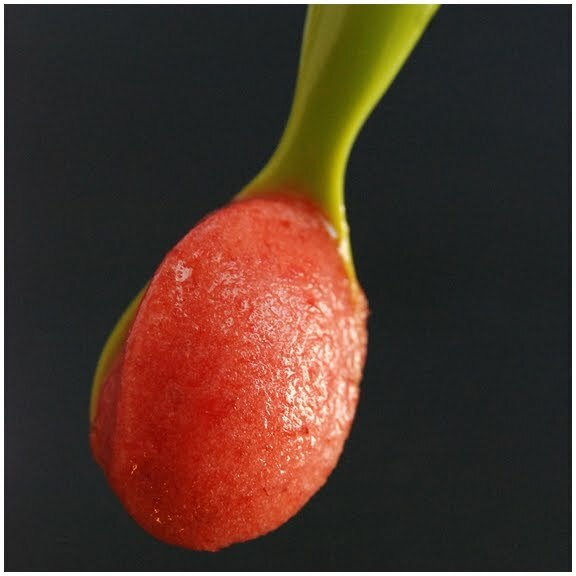 The shaft of the spoon is green like a stem and the sorbet like a plump exotic fruit. Really neat effect. It's still way too expensive for the to-get list, but it's always and forever been on my wish list ;) That looks like a tower of strawberry goodness right there! 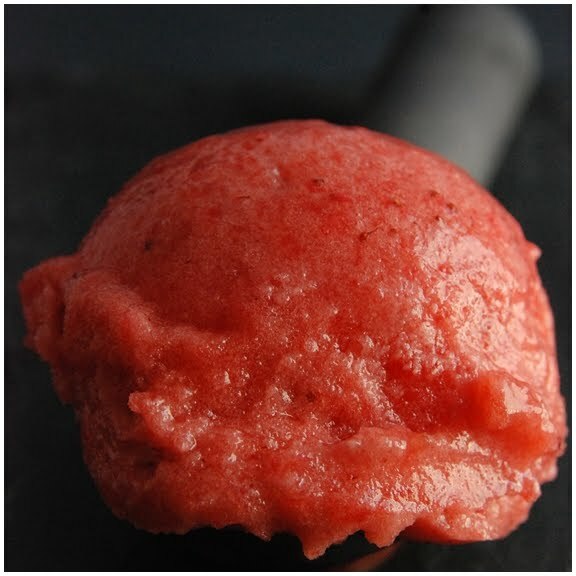 I love, love, love sorbet.....and yours look extra delicious and full of flavor!!! I love sorbet and this look incredible! Yummy! It's warm all year round in Singapore so this sherbet is always welcome! And it would be a perfect partner with lemon sorbet! love the color, I'm sure it tastes delicious as well! Umm yum yum yum sounds and looks delicious on a cold winters day and transports me to sunny summer days. Can't wait. Oh, dear. I've been longing for strawberries and lamenting the fact that we're so far yet from the season! 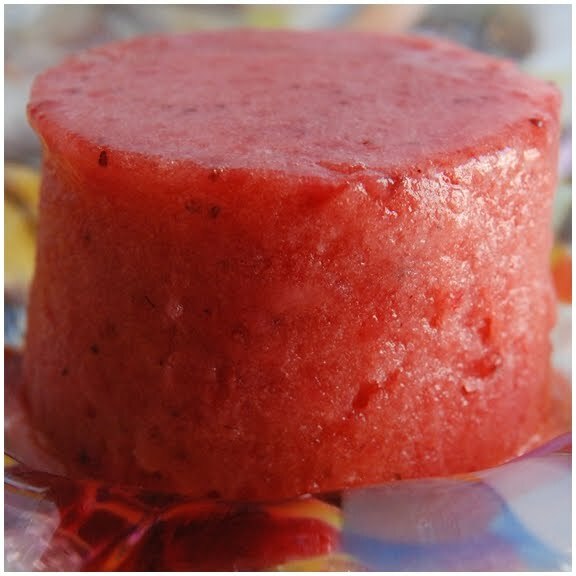 Sorbet is such a wonderful way to capitalize on the berry flavor. Just gorgeous. Thanks a lot, Shari. I've been resisting buying one of these for a year or so and now you've made it so hard to resist. Your sorbet looks ethereal! Ah yes, strawberry season is so far away at the moment here in NYC as well. I have a tiny non electric (hand crank!) ice cream maker that my parents bought me when I was a child. It was cheap i'm sure, but works amazingly making 1 pint of ice cream or sorbet at a time! I love that you're cooking all the recipes out of the LCB cookbook...takes me back to culinary school!